“It was one of those perfect summer evenings which simply beckoned everyone out-of-doors; and when my colleague suggested a walk, he made it doubly attractive by saying it would include The Spinster’s Rock and Bradmere Pool. There is such a wealth of glorious walks around Moreton and Chagford that one is never at a loss in choosing one, something fresh to be seen and admired every time. We alighted from the bus at Easton Cross, and it was not long before we were standing on the bridge over the stream at Mill End. This is indeed a lovely spot, and as I looked across the meadow towards the summit of Hunter’s Tor, I could trace the famous Hunter’s Path along the Teign Gorge which leads to Fingle Bridge. This view recalled a most memorable walk for me, for it was one of the first I took upon my arrival here. At the crossroads near by Sandy Park I noticed a well which is let into the wall by the roadside. It bears the inscription ‘Parford Well. Free to the Villagers of Sandy Park for Domestic Purposes. 1972. W.R.B.’ Those initials would appear to stand for a member of the Bragg family, whose home is at Furlong nearby. The well has a touch of the Gothic in its design, with a Maltese Cross on the top. Although it is not now used, it reminds the wayfarer of the days when the villagers had to fetch almost every drop of water. There is some lovely scenery along the main highway; and we were soon entering the field at Shilstone Farm where we found the cromlech, or dolmen known far and wide as The Spinster’s Rock. Its great antiquity made such a deep appeal to me that, as I admired it, I seemed to be whisked into the mists of ancient history. A notable point of interest here is that this field is almost in the very centre of the county. As I stood before that cromlech, which resembles a massive stone table, I naturally wondered how it had been erected. The three stout pillars are about 9 ft. high, and they support a slab which is 15 ft. by 10 ft. and weighs 16 tons. 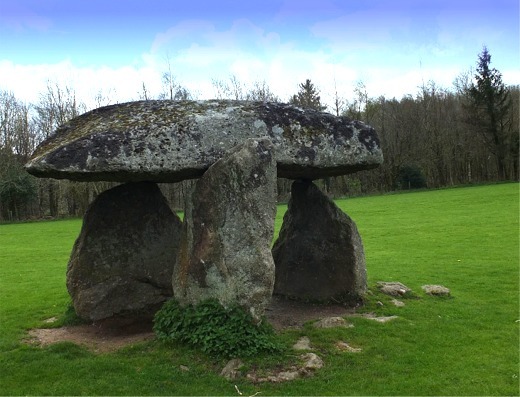 This is the only cromlech left standing in Devon. In our mechanical age with its variety of modern cranes and lifting tackle it would be fairly simple to erect such a monument, but a few thousand years ago it must have presented a most formidable task, whose completion must have been the talk for miles around. Those huge stones had to be sought for, and it is likely that were found on a neighbouring tor or on a hillside some miles away. Then they had to be transported to the site by a large gang of men, and most likely, rollers made of stone would be used. Standing under that slab I tried to visualise the number of times it had to be handled and transferred from one roller to another on its journey to the site. It must have been a most arduous undertaking. Perhaps horses or oxen helped? The burial site would have been excavated and prepared to receive the stones, and then the cromlech erected; and how interesting it must have been to see them hoist that slab carefully, inch by inch, to the top. I could imagine the signal being given that everything was ready to receive the body of the great leader or some other notable member of that community; and the actual ceremony of internment attended by a large crowd of followers. The ceremony over, the men would set to work constructing a huge mound, which would completely cover the cromlech, through the centuries, alas! the soil of that mound has disappeared. It is likely that many excavations have taken place here in the past, and an urn with burnt bones and ashes, pieces of pottery and ancient tools, have been found; or that those who have tilled that field have spread the soil of the mound over it, to leave the cromlech exposed as we see it today. No matter how ancient a monument may be, I always try to clothe it with life and to imagine it as it might have been at the height of its glory. The Spinster’s Rock is undoubtedly an important relic of the past, for stone circles were discovered near it about one hundred years ago. The stones of those circles have all disappeared, and I understand they were used for building purposes. The Spinster’s Rock collapsed in 1862, and it is recorded that it was a miracle that no one was seriously hurt, for the supporting pillars were in such a small depth of soil. 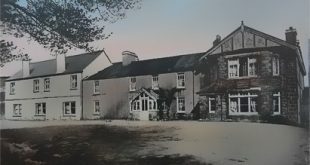 Through the keen interest and generosity of Mrs. Bragg, of Furlong, it was re-erected under the supervision of the Rev. William Ponsford, Rector of Drewsteignton. Why are those stones called The Spinster’s Rock? Legend seems ever to be the well-spring of romance, and the local legend, which seems to be the favourite, is that the stones were erected by three spinsters who accomplished their Herculean task one morning before breakfast! All the local guides include this very colourful explanation of the erection of this antiquity. It is also thought that those spinsters were spinners who, ‘going about with their pads of yarn to the yarn-jobber to be paid for it, saw the heavy stones unapplied to any use, and being strong wenches or giantesses, and to shame the men who, from weakness and laziness, had desisted from the task and raised the unwieldy stones to the height and position in which they remain. It is only a short walk from The Spinster’s Rock to the Bradmere Pool, and making our way down the narrow path from the road we soon reached the pool in its gorgeous woodland setting. I reacted at once to the profound solitude that reigns here, and my thoughts went back to the famous Silent Pool in Surrey – a favourite spot for pic-nics, which some of my readers may know. A local man has told me that the Bradmere Pool covers an area of three acres, is nearly 100 ft. deep, and that it was the site of an ancient tin mine. I have, however, no confirmation of this. I hear that it is a grand place for carp fishing. My informant went back fifty years or so, when he recalled a regatta being held here. Crews from Drewsteignton and Chagford competed in a rowing race over two lengths of the pool – about 400 yards; and it was won by the Drewsteignton crew. Quite a large crowd attended the regatta including many school children, who were regaled with ginger beer and buns. Bradmere Pool struck me as being large enough to be called a lake. We continued our evening walk through Drewsteignton and over Fingle Bridge, where we had to climb the rocky path leading through the woods to Butterdon; and we were not long in completing the last stretch to Moreton Town.” – The Western Times, December 3rd, 1943. Not only are such accounts enjoyable reading but it’s interesting to see other people’s impressions of their experience. In addition, as such sources are hard to come across there sometimes can be some avenues for further research. For instance, I had already posted a page on Bradmere Pool but never knew about the boat races. As always one can never take such snippets of interest as fact and always need more investigation. Sure enough a local newspaper report of the time not only described the event but listed the people who took part in the races. Whilst looking into this I also came across two reports of Bradmere Pool being a popular venue for winter ice skating in the late 1890s, again never knew that. Another comment that has really gotten my interest is that of there being a Maltese Cross on the old village well at Parford, again this needs some field investigation to see if it’s still visible. Finally another comment that caught my eye was that the field in which The Spinster’s Rock stands is; “almost in the very centre of the county.” Again, nothing of great importance but something I would like to confirm, but how is another question.